Libya's new rulers prepared Thursday to welcome British Prime Minister David Cameron and French President Nicolas Sarkozy, whose forces spearheaded the NATO air war that helped topple Moamer Kadhafi. It marked the first visit to the new Libya by any foreign leader and came as forces of the National Transitional Council were still battling Kadhafi loyalists in a swathe of territory from his hometown of Sirte on the Mediterranean coast through a string of Saharan oases towards the southern border. A huge convoy of pickups mounted with heavy weapons massed on the coast west of Sirte early on Wednesday in readiness for what commanders said would be a pincer movement against the city, an AFP correspondent reported. 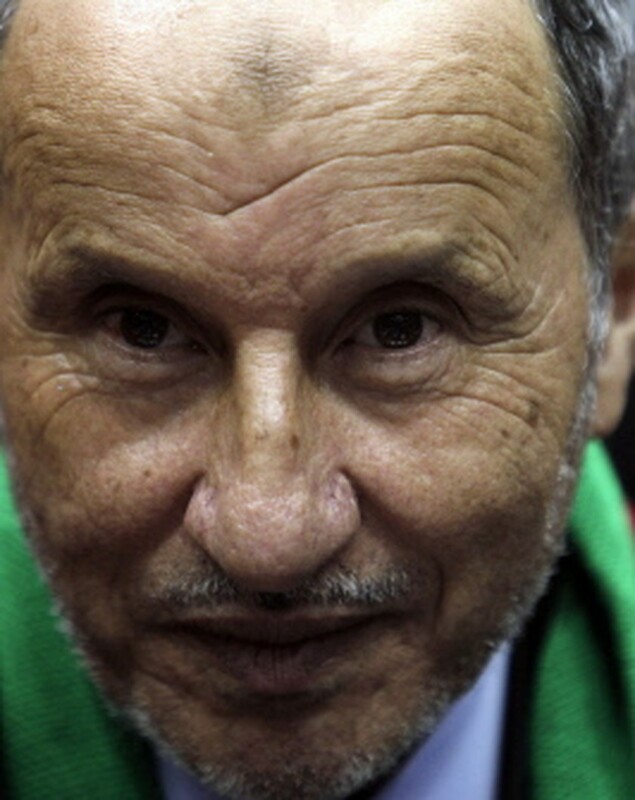 Libya's Libya's National Transitional Council Leader Mustafa Abdel Jalil looks on during his visit to Zawiya on September 14, 2011. Half of the column massed at Tawurgha, south of Libya's third-largest city Misrata, would advance straight along the coast road, commanders said. The other half would strike south into the desert towards the town of Waddan in the Al-Jufra oasis in a bid to cut Sirte off from Kadhafi's other principal bastion, the south's largest city Sabha, they added. The offices of both Cameron and Sarkozy declined to comment when asked about the trip but NTC chief Mustafa Abdel Jalil confirmed the visit to AFP. In a BBC interview ahead of the two leaders' arrival, Abdel Jalil, promised that Tripoli had now been sufficiently secured since its capture from Kadhafi forces last month for the visit to go ahead. "We say to the leaders coming tomorrow (Thursday) that they will be safe," he said. AFP correspondents in the capital reported a massive security operation on Thursday with roadblocks along the road in from Metiga airport on the eastern outskirts and a luxury hotel in the city centre cordoned off by security forces backed up by French officers. Abdel Jalil appealed in the BBC interview for new weapons deliveries to help capture Kadhafi's last remaining bastions and complete his country's liberation. He said that many of Kadhafi's remaining forces had now massed in the far south and that the NTC needed more arms to defeat them. "There will be fierce battles in Sabha with equipment that we do not yet have, and we ask for more equipment to retake these places," he said. During the seven-month uprising that ended Kadhafi's 42 years of iron-fisted rule, France made controversial arms drops to rebels in the Nafusa Mountains southwest of Tripoli, insisting they did not violate a UN arms embargo imposed on Libya. Relying heavily on British and French aircraft, NATO has kept up a daily bombardment of Kadhafi's remaining outposts since the fall of Tripoli to NTC forces last month. On Wednesday, the alliance said it had hit nine targets around Sirte, seven around Waddan and one in Zillah, another Al-Jufra oasis town further east. A commander of one of the NTC brigades massing in Tawurgha said there were many hundreds of heavily armed vehicles involved in the looming offensive. "This convoy, I can't give you the exact number, but it is about 500 vehicles or more," Fawzy Sawawy, a commander of the Mountains Brigade told AFP. "We are going to surround and free Sirte," he said. "We want to clear the road from Ras Jadid (on the Tunisian border in the far west) to Sallum (on the Egyptian border in far east)." Kadhafi spokesman Mussa Ibrahim accused Libya's new rulers of "starving" loyalist areas in their bid to subjugate them. "Daily life in Sirte and Bani Walid (a desert town to its southwest) is very difficult," Ibrahim, who is also a cousin of the toppled tyrant, told Syria-based Arrai television. "They are starving entire regions to force the people to give themselves up," he said. "They have cut off electricity and water as well as supply routes and are preventing food and medicines from coming in, thereby violating all international norms." Ibrahim, who did not say where he was, said Kadhafi was in "perfect health" and that his morale was up but did not indicate the fugitive strongman's whereabouts. Kadhafi had earlier appealed from his hideout for the international community to help his hometown of Sirte. "It is the duty of the world not to leave (Sirte) alone, and everyone must assume their international duty and immediately come to stop this crime," Kadhafi said in a message broadcast on Arrai. Ibrahim said the battle for Sirte was "near," and added: "We are ready for war, even if it lasts for years." The visit by the two European leaders comes a day after senior US State Department official Jeffrey Feltman held Tripoli talks with Abdel Jalil in which he pledged Washington's support for the new Libya. Another top US diplomat later hailed NATO's air war as a "model" for future cooperation between European members of the alliance and the United States. "What is new about Libya is the approach that the United States would do an initial phase that only the United States could do, and then that Europeans were playing a leading role in certain aspects," said Assistant Secretary of State for European Affairs Philip Gordon.